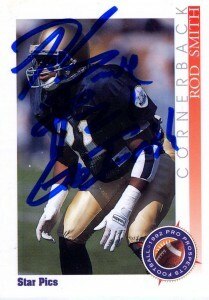 I got Rod’s autograph as part of a blitz of the New England Patriots back in the early 90s. He signed the card and put “Go Irish!” on it. Drafted in the second round of the 1992 draft, Rod was a bit undersized at 5’11”, but made up for it with his explosive hitting and speed. A track man, Smith possessed great closing speed and was once clocked at 6.35 in the 55. During his time with the Irish, Smith even took some time in starting 7 games at strong safety, but would see his time in the NFL at corner. He made one pick his rookie year for the Patsies in 1992, and 2 in 1994, playing mainly on special-teams. In 1995, Rod was left exposed by the Patriots and was selected by the Carolina Panthers in their expansion draft. He was the Panthers’ first selection. Smith would sign with the Vikings in 1996, but quickly returned to the Panthers during that season. He’d make 2 interceptions in 1998 and finish out the season with the Packers where he retired after the season. Since retiring, Smith has done some charity work, was the President of the Alumni Chapter of NFL players in the Carolina area, and recently appeared at a NASCAR Track Walk event as the Grand Marshall in 2011.